The Tennessee Walking Horse Breeders' and Exhibitors' Association voted on Monday to cancel their Invitational Horse Show originally set for Thanksgiving weekend in Murfreesboro, TN. The show had been planned to crown a 2006 World Champion, after the final class was shut down at the Walking Horse Celebration because the majority of horses in the final class did not pass inspection for USDA/American Horse Protection Act soring regulations. Welfare and Safety Summit Participants Recommends Banning Toe Grabs, Stickers, Turndowns and Jar Calks. A cross-section of prominent participants from the Thoroughbred breeding and racing industry who attended the Welfare and Safety of the Racehorse Summit in Lexington, Ky., on October 16 and 17 have drafted action plans in six areas to improve conditions in various facets of the Thoroughbred industry. The six areas are Education & Licensing; Racing Conditions/Racing Office; Research; Health & Medical Records; Racing Surfaces/Shoeing/Hoof Care; and Breeding Practices. * Make efforts to have scientific research more widely distributed among industry stakeholders. 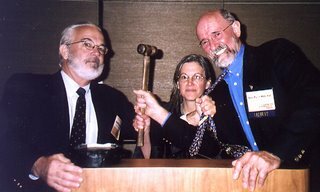 * Examine the use or ban of certain horseshoes, such as toe-grabs, in the wake of presentations and research by Dr. Sue Stover and other participants. * Provide continuing education for all horsemen, exercise riders, farriers and make initiatives like the Groom Elite Program more available throughout the country. Above material quoted from a press release provided by the Jockey Club. Mitch Taylor gave a brief presentation about shoes and shoeing and was on the working session committee designated to tackle the subjects of shoeing and surfaces. Hoofcare & Lameness reached Mitch Taylor at home this evening. He said that he had been contacted before the meeting by the Jockey Club to present information about shoeing and hooves, and that when he arrived at the meeting, he realized that he was the lone representative of the farrier profession. Mitch gave a half-hour presentation which included an overview of hoof anatomy and function. At the working session, the sub-committee recommended banning grabs, stickers, jar calks and turndowns by the end of 2007. Mitch Taylor was charged with reporting the group's recommendations to the larger group. The subject did come up about the use of toe grabs on hind feet, with a question being directed to Dr. Sue Stover of the University of California at Davis. As a result of her answer, the recommended ban would only cover toe grabs on the front feet. Other recommendations included that horseshoers, trainers, and grooms should be required to show proof of continuing education efforts. One recommendation was that cd-roms be distributed for study, with questions to be answered before a track license can be granted. Mitch said that he had discussed his role in the meeting with Thoroughbred expert farriers Steve Norman of Kentucky and Simon Curtis FWCF of England. He said that he had not been asked to be a spokesperson for any farrier group or school, but simply to provide information. A few trainers and jockeys also provided information, but the majority of information came from a massive binder of research studies compiled from veterinary research. Veterinary surgeons Wayne MacIlwraith, Rick Arthur, Larry Bramlage and Sue Stover made presentations, as did Mick Peterson, a footing engineer who specializes in racetrack impact studies. "I am glad that the Jockey Club decided to invite someone like me to be part of this meeting," Mitch told Hoofcare & Lameness. "Farriers and the work they do should be part of the big picture of lame horses, decreased numbers of starts, and breakdowns. "A lot of good information was presented at this meeting," he continued. "I really believe that each person who was there wanted to do what they can to prove that the racing industry really does have the interest of the horse at heart. The recommendation about education was especially important, I think. More education will be good for the industry." No date was set for a second meeting of this study group. According to the AFA's web site, the association has moved its "Professional Farrier" publication from Ink and Anvil in Washington to Sebastian Publications in Georgetown, California. SP, which formerly published "The Anvil", a farrier magazine that went dormant several years ago, will be the third publisher of "Professional Farrier" since 2003. Ink and Anvil will launch a new magazine called "Today's Pro Farrier". One of the world's largest assemblies of farriers is planned for October 26-28 in Krueth, near Nuremberg in the Bavaria region of southern Germany. Organized by Josef Luber of Luwex, the "farrier's festival" is in its fourth renewal; last year's event attracted about 600 farriers from 21 countries. The Luwex event is a marathon of farrier lectures and demonstrations from morning to midnight. Held at Europe's largest equestrian show facility, farriers stay at a four-star hotel on the showgrounds, and eat in on-site restaurants. This year's theme is better educational cooperation between the USA and Europe. US speakers are Mike Savoldi, Michael Wildenstein and Scott Morrison. European speakers include Hans Castelijns (Italy), Billy Crothers (Great Britain), Lorenzo d`Arpe (Italy), Bernard Duvernay (Switzerland), Andy Hermann (Austria), Kai Kreling (Germany), Dieter Krohnert (Germany), Rob Renirie (Holland), Sigi Simonson (Iceland). Also from Germany: Uwe Lukas, Carsten Neumann, Björn Tangemann, Simon Alt, Jörg Ohl, Rainer Koch, Thorsten Egert and Gudmundur Gudmundsson. Translations into Spanish, English, French, Italian and German will be provided, and a trade show of international vendors is planned. For more information, visit http://www.luwex.de/ and click on your favorite language. Or call 011 49 09604 9099222 (from the USA). Carlos Lara of Mustad/Capewell/St. Croix loaned us this photo of an elephant's foot that had been patched with one of Mustad's glueable crack patches. 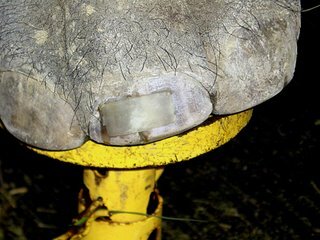 The elephant's foot is fascinating, but many elephants develop foot problems in captivity, with cracks being high on the list. There is a veterinary textbook dedicated solely to diseases of the elephant's foot. Giraffes in captivity seem to have a lot of hoof problems too. Thank you, Carlos, for sending this image! Veterinarians at Penn’s George D. Widener Hospital in Kennett Square, Pennsylvania changed Kentucky Derby winner Barbaro’s cast on Monday, October 9. Barbaro is recovering from injuries suffered at the Preakness on May 20. Barbaro had another successful pool-recovery, and was resting comfortably in his stall after the procedure. In addition to replacing the cast, doctors trimmed his feet and applied a new shoe on the right hind foot. A few hours after recovery, he was taken back outside to graze and was comfortable on both hind legs. Barbaro’s left hind foot, which had laminitis, continues to gradually improve. “There is good growth along the quarters (closer to the heel) but there will need to be much more healing along the front of the hoof,” said Dr. Richardson, who cautioned that “we still have many months of healing ahead of us. For more information on Barbaro, please scroll down to read previous news articles on this high profile case. Mark your calendars for the first weekend in November of 2007, and plan to attend the 4th International Equine Conference on Laminitis and Diseases of the Foot, a.k.a. "Palm Beach Laminitis". The 2005 event was probably the single largest gathering of Hoofcare & Lameness subscribers ever. I loved every minute of it and look forward to seeing you all again next year! I'll set up a separate blog for the event and post photos from last year. Watch this space for more information! Drs. Sue Dyson of England and Jean-Marie Denoix of France, who both spoke at the conference, danced beneath the stars on the top deck of the yacht chartered for all the attendess, speakers, and exhibitors, thanks to our gracious hosts, Mr. and Mrs. John Castle. Speaker Katy Watts of Safergrass.org in Colorado discussed grass laminitis with Ivy and Pete Ramey of Georgia after her wet lab. All photos copyright 2005 Hoofcare & Lameness Journal. Wet lab demonstrator Aaron Gygax of Switzerland is currently living in the USA and working as a farrier at Rood and Riddle Equine Hospital's Podiatry Clinic in Kentucky; he is chatting with James Gilchrist, farrier at Palm Beach Equine Clinic in Florida. 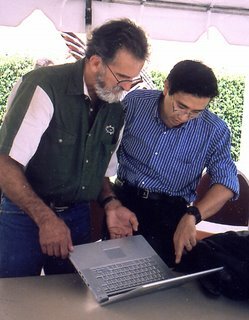 Dr. Ric Redden, recipient of the conference's Lifetime Achievement Award, checks something on the laptop of Japanese researcher Dr. Kuwano, who is an expert on white line disease. Ink and Anvil publisher Scott Davidson announced on Monday that his company will no longer publish Professional Farrier, the association magazine of the Lexington, Kentucky-based American Farrier's Association. "I terminated the contract, effective today," Davidson said this afternoon. "I will have a big announcement in a few days." The American Farrier's Association may have found a new publisher for the magazine, from hints left on the AFA's bulletin board by acting executive director Michael Nolan. Hoofcare & Lameness has no official statement from the AFA in this matter. Nolan did confirm on Tuesday that Professional Farrier will continue to be published, although by whom is not clear. He did not have a comment on relations between the AFA and Davidson's company. The AFA signed a multi-year renewal of their contract with Ink and Anvil this spring, soon after Nolan was hired and after David Ferguson was elected president. Craig Trnka started the AFA in the publishing game during his presidency, when he initiated a split from the American Farriers Journal, which had formerly been sent to members as a benefit. Before Ink and Anvil, Professional Farrier was published for the AFA by Dockery House Publishers of Dallas, Texas. Got oxygen? Coolmore Stud, one of the world's leading nurseries of Thoroughbreds, has plenty of it. They have just installed a hyperbaeric oxygen chamber at their main stud in County Tipperary in Ireland, home of some of the world's most valuable horses. According to a report in today's London Times (Irish edition), Coolmore co-owner John Magnier plans to use the chamber for soft tissue injuries and laminitis therapy, but also has hopes that it will help with breeding problems of the farm's roster of stallions. Hyperbaeric oxygen therapy has been used by human athletes for years, and in particular by deep-sea divers suffering from decompression ills. Horses were first exposed to the high-pressure treatments in Canada, where the therapy is common among hockey players. In the U.S., a chamber is in use at Winstar Farm and at Keswick Equine Therapy Center, both in Lexington, Kentucky and at Alamo Pintado Equine Hospital in the Santa Ynez Valley of California. The therapy is also in use in Australia, according to the Times report. Farrier/veterinarian Federico Oyuela of Buenos Aires, Argentina built and operates a chamber at the racetrack in that city, and is keen to share his experience and results. Coolmore's chamber cost more than a million euros; Federico has a more economical route to oxygen for horses that may make the therapy a more realistic alternative for therapy centers and veterinary clinics. 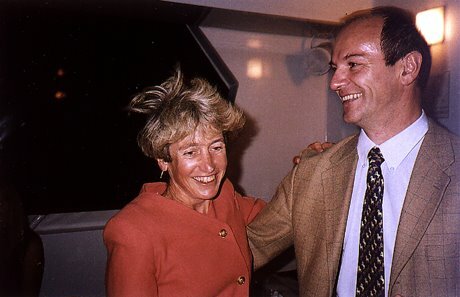 News from the UK is that Edgar Stern MBE FWCF died last Thursday. Hoofcare & Lameness is trying to get more information. Mr. Stern was at the helm of one of Britain's great farrier dynasties. Working with his sons Trevor and Clive, and with his wife Joyce running the business, Mr. Stern trained dozens of farriers, judged competitions and influenced farrier profession developments in England and, by extension, the world. The Sterns' ancient forge outside Maidstone in Kent is a frequent destination for visiting farriers from around the world, where all found a warm welcome and stimulating--and often even challenging--conversation on the role of the farrier in the horse world. Mr. Stern was well-known judge of farrier competitions and visited the United States in the early 1980s. Also at that time, he was recognized by HM The Queen for his contributions to farriery with the award of the British Empire Medal. I was one of probably thousands of people who visited the Sterns and saw firsthand how their multi-farrier and mega-apprentice business operated with military precision. I remember the din in the forging ceasing instantly when Mrs. Stern appeared with the tea pot. We hear much about multi-farrier practices in the USA, but the Sterns had always been doing it, and without a business plan, a mission statement or management consultants, because that is what they had always done. Still, Edgar found time to be my personal tour guide and told stories late into the night. Few people I have met in my career have taken the profession of farriery as seriously as Edgar, nor given as much to its development. This is a great loss and world farriery should stop, take its breath today, and consider who amongst us could even hope to fill the void that is left with his passing. According to the web site harnessracing.com, and as quoted on the US Trotting Association web site, leading pacing sire Artsplace has been moved from Southwind Farm in New Jersey where he has been standing at stud. The 18-year-old sire of no less than 14 $1 million winners has been suffering from laminitis for some time, and will now be treated at the University of Pennsylvania's New Bolton Center outside Philadelphia. This is the same hospital where Kentucky Derby winner Barbaro is recovering from a fractured hind leg and contralimb laminitis. 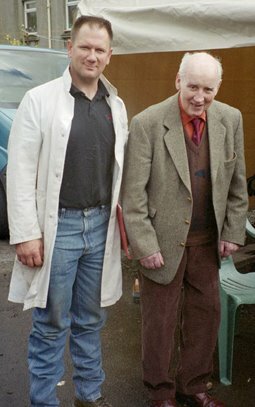 Today, October 2, is Edward Martin's birthday; the godfather of modern farrier friendships turned 81 at home in Closeburn, Scotland, where he is quietly battling the effects of Parkinson's disease. Even so, reports are that Edward is getting out of the house and attending church regularly. His sister Jane is attending to him. Contrary to some reports, Edward is not withering away in a nursing home, nor has he had a stroke or heart attack. He is quite ill, however, and the effects of the debilitating disease are tough punishment for such an active, vital man. In the photo: Edward Martin visited the Clydesdale shoeing competition named for him at the Museum of Scottish Country Life last September. 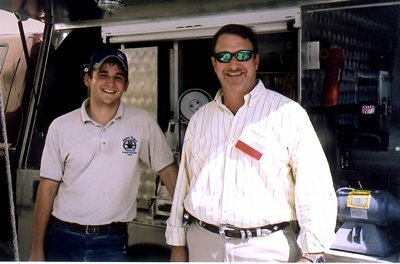 Here he is with American farrier (and judge that day) Mark Milster of Oklahoma. Thanks to Jean Meneley of Reno, Nevada, who visited Edward and loaned her photos.